The FIBA Americas U18 champions were handed the gold medal trophy, leaving the silver medal position to Canada. The hosts ended up on the losing side of a 113-74 match against the Americans Saturday. Argentina joined the two countries on the podium as the tournament’s bronze medalists. From the moment the game tipped off, team USA looked dominant. The starting five owned the floor, executing all the right plays. Point guard Cole Anthony and teammates managed to surpass Canada in the race towards the gold medal early on in the game and kept a steady pace, exhausting their rivals from the start of the final matchup. By the end of the first quarter, they were up by nine points and after three more quarters of play, found themselves leading Canada by 39 points. Guard Josiah James and forward Armando Bacot took care of the defense while Anthony and forward Matthew Hurt ran a splendid offense leaving zero chance for Canada to consider doing something about it. The fluidity of play that team USA had was extraordinary, it demonstrated strong preparation and unlikely readiness. “I always thought that certain teams were challenging. Canada is obviously a good team; our guys did a great job today. 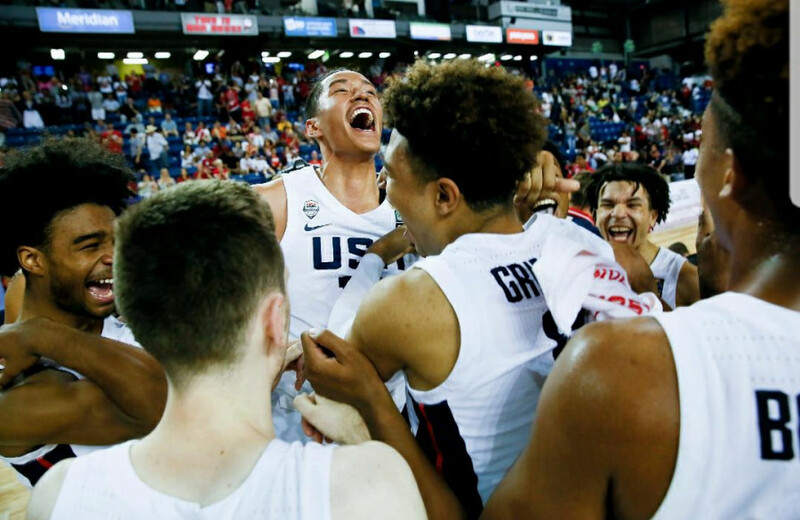 It was fun to watch,” said team USA head coach Bill Self. In defiance of their contenders, Canada’s AJ. Lawson and Quebec native Tyrese Samuel put up strong offensive and defensive efforts. Their work earned them 31 points and 23 rebounds combined, allowing them to nearly keep up with the pace that team USA was setting. Their efforts fell somewhat short and the aggressive start to the game by their rivals kept them far behind the finish line towards the gold medal. “We need to continue coming out stronger and be more confident for next year’s World Cup in China,” said Canadian all-star point guard Andrew Nembphard. Nembphard posted 12 points, seven turnovers and eight assists in 35 minutes. “Sometimes the first experiences don’t go that well and this was a first experience for us,” said Canada’s head coach Dave Smart. Team Argentina made it to third place, earning the bronze medal after a slow and difficult comeback against Puerto Rico in an 87-79 contest. The Argentinians trailed until the start of the fourth quarter. The Puerto Rican team was up by five when Argentina decided it was time to flip the script and turn the odds in their favor. This hope for the bronze medal was quintessential for both teams. All-star team player and center Francisco Caffaro delivered 21 points and 10 rebounds to the game while his teammate and point guard Marco Giordano executed 21 points and 9 assists. “The bronze position is the best thing that Argentina could earn, we are very proud holding the position behind USA and Canada,” said Argentina head coach Maximiliano Enrique Seigorman. Seigorman added that he knew that USA and Canada had very solid basketball programs, and that he doesn’t regret suggesting to play against them. He feels it was good preparation for the team, as they’re headed to the Basketball World Cup in China in 2019. While it may have acted as good preparation, the tournament also serves as a display for some up and coming basketball talent from across the world. Certain players from both the USA and Canada squads are headed to the NCAA next year. Most notably are Ontario point guard Andrew Nembphard, and USA guard Josiah James. Nemphard has committed to Florida State University’s Gators for the class of 2018. James has announced his commitment to Duke University, who will be paying visit to Montreal in August to face the McGill Redmen in a preseason match. The FIBA Americas U18 Championship was hosted in Canada for the first time ever in Canadian basketball history. The Meridian Center held over 4200 fans during the gold medal game Saturday, making it the highest attendance that the Niagara region facility has ever seen.